Description: The Celtic Button Necklace is a Micro-Macrame design because it is made with delicate Satin cord material. 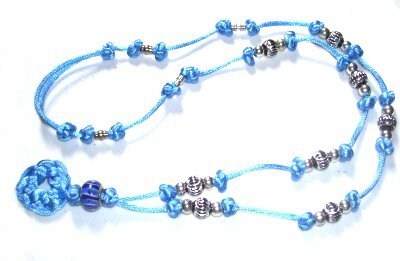 It features the Celtic Button knot arranged on either side of beads. The closure is a sliding clasp made with two button knots in an unusual arrangement. The pendant can be made using a variety of decorative knots. The Celtic Ring Knot is shown in the example, and is described below. 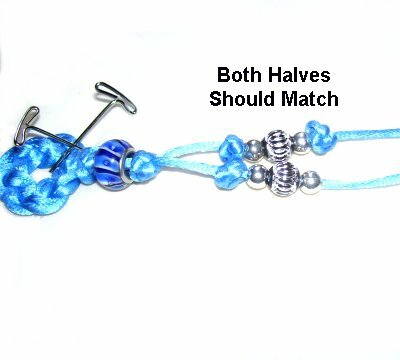 Since button knots are a challenge to tighten, this Macrame pattern is rated Moderate, suitable for those with experience. Important: When using Satin or other delicate material, do not push pins through the cord. 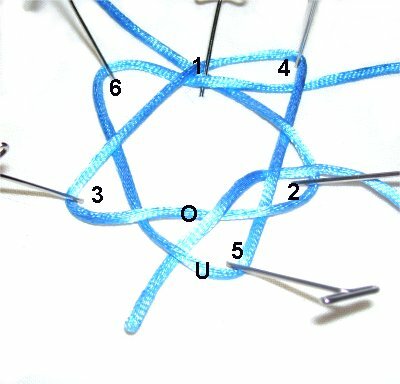 Instead, using the Cross Pin Technique or LEAN the pins over the cord. The Celtic Button Necklace features a knotted pendant, but you could also use a regular metal or glass pendant. Click on the images below to view suitable knots for a pendant. Double the knots when possible, to make them larger (using one cord). Step 1: Cut one cord for the Celtic Button Necklace, at least 4 yards long (20 inch to 24 inch necklace). Secure one end near the center. Moving clockwise, create a triangle with the working end. Mentally number the three angles as shown. Secure each angle in this step as well as the next. Step 2: Move the working end to the left, to form the 4th angle. Bring it down to the area between angles 2 and 3, to form angle 5. It should pass under angle 2. Bring the end up to the left side of the pendant, passing it under angle 3. Step 3: To create the last angle and begin the weaving, move the working end to the left. Pass it under the segment between angles 1 and 3. Pass it over - under the two segments at angle 4. Weave the end through Angle 2, heading left to right. Weave the end through Angle 5, heading downward. Weave the end through Angle 3, heading left to right. Step 7: To complete the weaving, pass the end through the two segments at Angle 6. Pass it over the secured end as well. Step 8: Now you need to double the knot so the pendant for the Celtic Button Necklace is a bit larger. Move the working end over the segment at the top right area, near angles 1 and 4. Then follow the path of the first cord all the way through the knot. 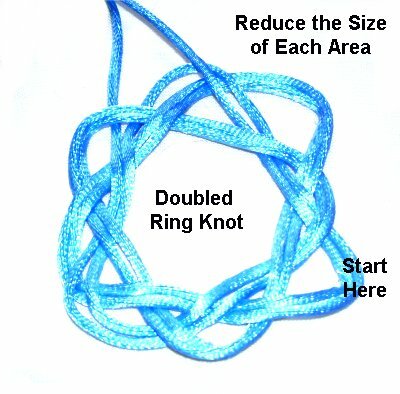 Design Tip: When doubling this knot, the best approach is to stay on the outside of the first portion. Keep the coils flat and neatly arranged. Step 9: Tighten each area by pulling the slack out gradually. Start near angle 2 at the bottom right. Step 9, continued: You can reduce the size by pulling on both the first knot and the doubled portion (working together). There will be an area at the top that is loose, which will need to be adjusted separately. 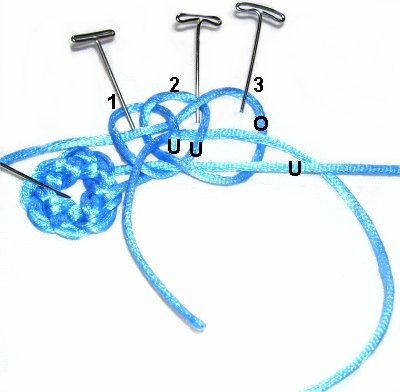 The other option is to remove the slack from the first knot, then do the same with the doubled portion. Step 1A: Arrange the pendant for the Celtic Button Necklace, so it's on your left. The longest cord should be at the bottom. The one at the top holds the knot, since you are making a Sliding button knot. Pass the working cord under - over the holding cord, rotating counter-clockwise. 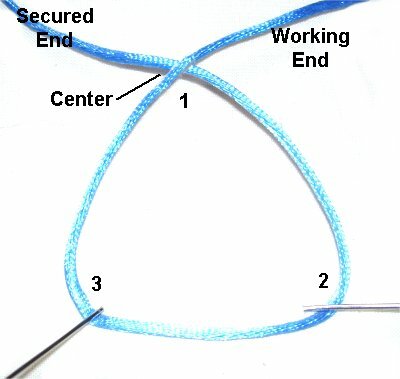 Step 1B: Pass the working cord under the holding cord, and create Loop 2. Arrange it partially over Loop 1. Step 1C: To create Loop 3, rotate the end counter-clockwise, under the holding cord. Weave it through, over - under - over - under loops 1 and 2, heading right to left. 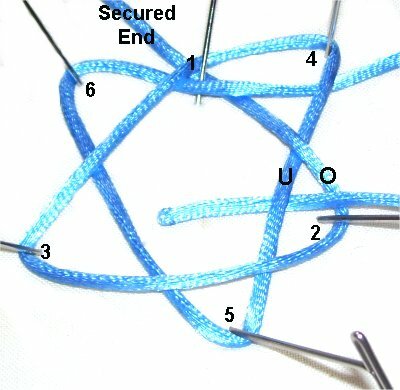 Step 1D: To create the 4th loop, rotate the end around again (counter-clockwise), passing it under the holding cord. Pass it over the first segment (loop 3), and under the next two segments (loops 1 and 2). Position loop 4 below the others, so it's easy to identify. The Celtic Button Necklace is made entirely of these knots, so you must know how to tighten them successfully. The best approach is to tighten the loops in order (1 - 4). 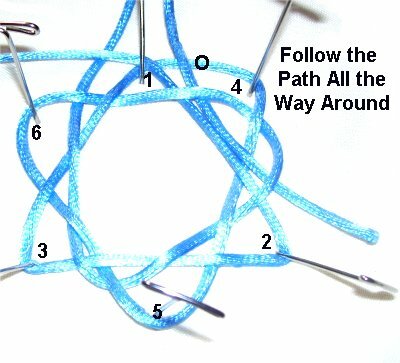 Pull on loop 1 to bring the entire knot close to the pendant. Hold it steady against the work surface as you pull on loop 2, which will tighten it. Hold loop 2 steady as you pull on loop 3. By now the knot should be a bit more snug. Pull on loop 4 to tighten loop 3. Make sure the knot is round and compact. If it's not, go back and tighten each loop a bit more. 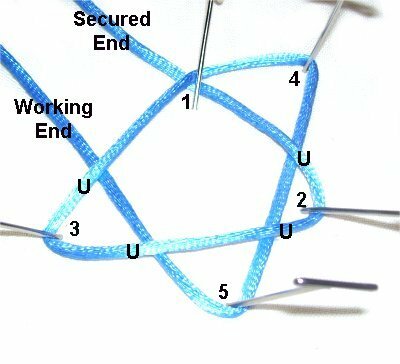 Once the knot is the size and shape you want, pull on the end to tighten loop 4. The Celtic Button Necklace can be decorated in many ways. 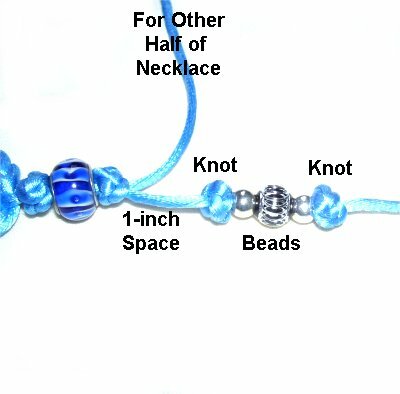 This is just one example of the bead and knot arrangements. Buttons, shells, and charms can also be used to decorate the overall design. Step 2: Slide the first button knot close to the pendant. Add the focal bead, and tie a second knot. Tie the first loop as close to the bead as possible. 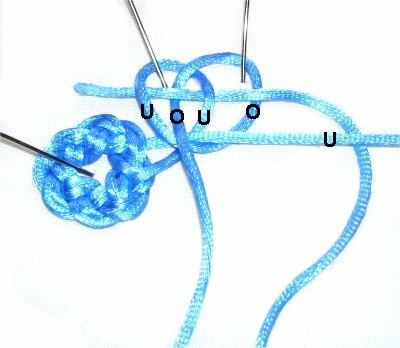 When you tighten the second knot, remove ALL the slack from loops 1 and 2, and tighten the loops firmly. Step 3: Separate the two cords, so you use only one for each half of the Celtic Button Necklace. Leave a 1-inch space, and tie a regular button knot. 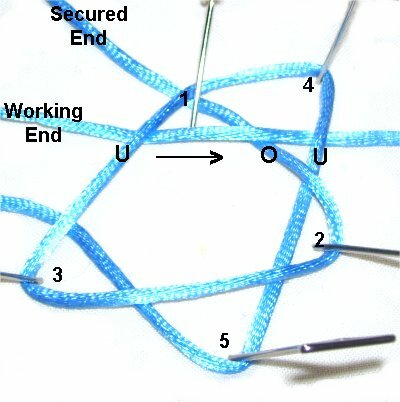 This variation does not have a holding cord, but is tied the same way (step 1). Add small beads and tie the next button knot. 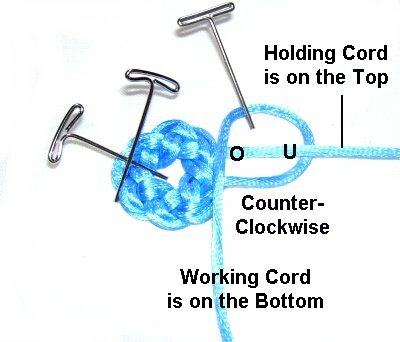 Design Tip: Loops 1 and 2 determine the position of the button knots on the cord. 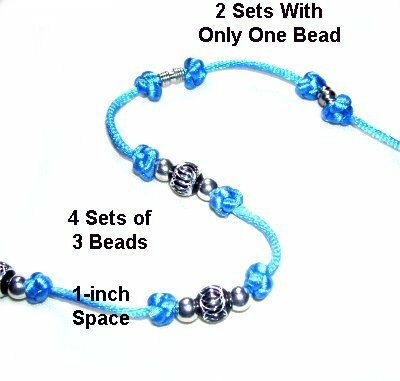 Once the first knot is tied, slide the beads against it. 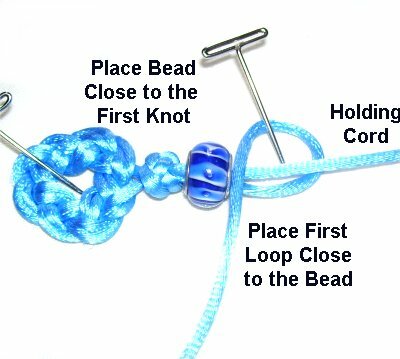 As you make the next knot, create the first loop against the other side of the beads. 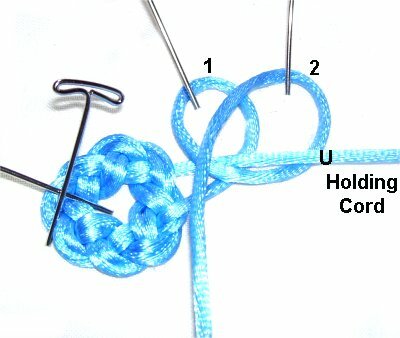 Pull firmly on loops 1 and 2 to keep the knot as close to the bead as possible. In the example shown, I used 4 sets of 3 beads. One inch of space was left between each beaded design. I switched to one bead between the knots, so the Celtic Button Necklace would not be so bulky at the back of the neck. Step 4: After the beads are arranged to your liking, and the first half is the length you need, it's time for the second half. The button-bead arrangements should match as closely as possible, along with the spacing. 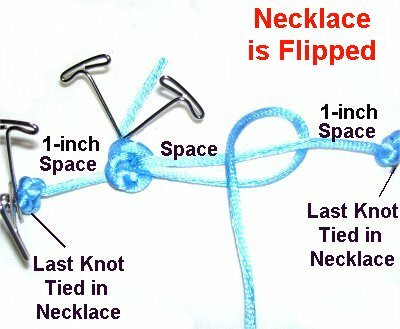 IMPORTANT: The sliding clasp described below is made with two button knots, which means the necklace fits over the head. So you need to leave enough space between the two knots to adjust the size. If you prefer, you can add a regular metal clasp, so the ends can be separated. Step 5: Make a circle with the Celtic Button Necklace, so the ends head in opposite directions. 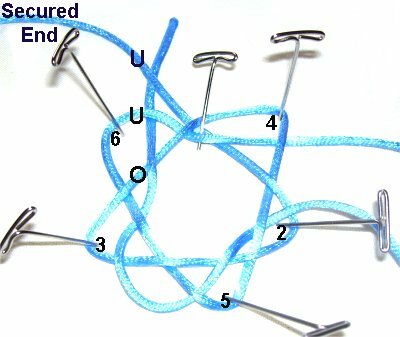 Use the left end to tie a button knot onto the right end (same as step 1). Leave a 1-inch space between this new knot and the last one tied on the right. 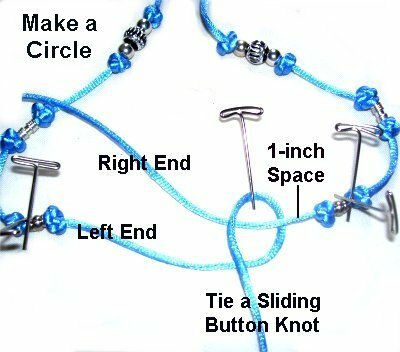 Design Note: I flipped over the necklace when I made the second knot so I could tie it in a counter-clockwise direction (see photo below). Switch cords, so you use the right end now. Tie a button knot onto the left end. 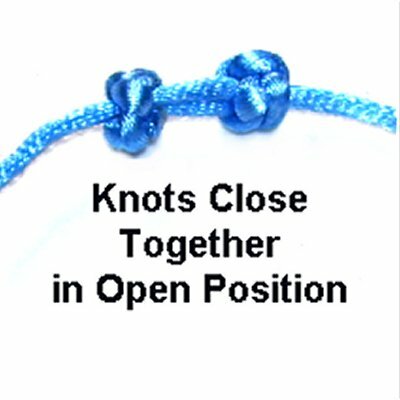 You can leave as much space between the two knots as you wish. 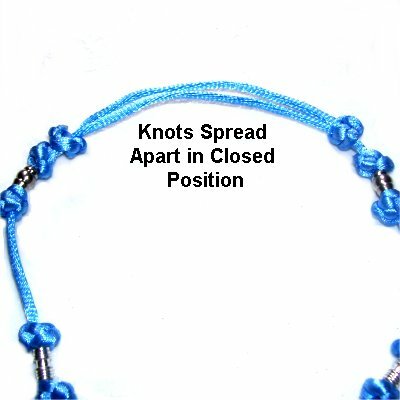 To keep the design balanced, leave 1-inch of space between this knot and the last one tied for the necklace. 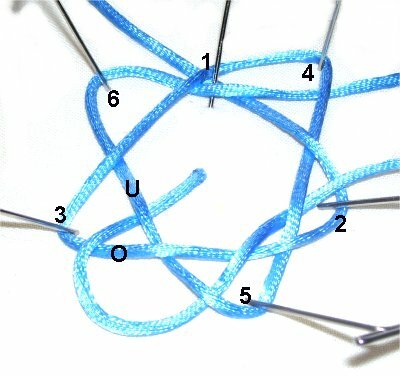 Finishing: Apply a small amount of glue to each knot for the clasp, right where the end comes out. After it's dry, cut off the excess material. You can heat fuse the end if the material is Satin, since it's a synthetic fiber. Don't heat material that is natural, like Hemp. Just use glue. <<< The knots in the clasp will be close together when the necklace is in the open position. Have any comments about the Celtic Button Necklace? Contact Me.